Horror and comedy go together better than most genre combinations. It’s fun to be scared at the movies and it’s also fun to laugh at yourself being scared, so why not mix both into one movie? In 1980, Sean S. Cunningham created one of the most iconic horror franchises ever with his movie Friday the 13th, and Steven Miner continued his franchise with two sequels. 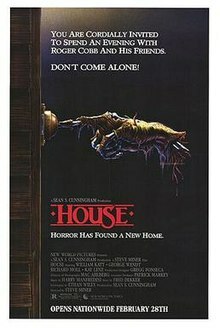 What some people may not know is that they collaborated again in 1986 with a horror comedy called House. It wasn’t as big of a success as their previous works, but it did spawn a series that I’ve never really heard anyone talk about. Could there be a reason for that? Let’s find out. Roger Cobb (William Katt) is an author who is struggling to find inspiration for his new book about his experiences in the Vietnam War. After his estranged aunt (Susan French) commits suicide in her home, Roger decides to move in and take care of the place while also hoping to be inspired in the house he used to live in before a tragedy forced him and his wife, Sandy (Kay Lenz), to separate. What Roger wasn’t expecting was that this house would be a portal for all sorts of creatures and ghouls to come through and torment him during the night and threaten his very existence. Now, it’s up to Roger and his especially nosy neighbor, Harold (George Wendt), to stop the specters from threatening the rest of the neighborhood and completely destroying Roger. There are plenty of reasons that make House an appealing movie to see. For one thing seeing the Greatest American Hero and Norm from Cheers teaming up to fight creatures in a haunted house is hilarious. Both William Katt and George Wendt bring their comedic chops to the table while also functioning well in the film’s more serious scenes. There’s also some clever special effects and creature design that don’t use any kind of computer effects, of course. I’m a sucker for things like that so any movie that utilizes these kind of costumes already has a leg up in my book. While House is definitely more of a comedy, it does also touch on the PTSD that many soldiers go through after a war, with this one being Vietnam. It adds a layer of drama that was a little unexpected, but certainly welcome. While there’s plenty to enjoy with House, it really isn’t all that special. A lot of the comedy is very childish despite the movie being rated R, and I don’t feel like it really embraced the off the walls insanity it may have been going for. I just felt like something big was missing from this movie. There’s no scene that’s exactly memorable and it’s a movie I feel like I may not remember too much about as time goes on. It also takes quite a while for things to really start happening, which is kind of strange because this is a pretty short movie at just an hour and a half. There’s also a character who exists solely so that there can be a funny scene with a kid in the middle of the movie. It was a really entertaining bit, but this character was just useless and didn’t make any kind of impact on the story. One of the first words I used to describe House after I just finished watching it was “cute.” It’s a serviceable horror comedy that can be easily watched and disposed of. I really wanted a lot more from the movie, however. For an R rated horror comedy, it’s really quite tame, and that’s surprising since it’s coming from the creative forces behind Friday the 13th and a few of its sequels. This is a movie that seems to have sort of faded into obscurity despite the fact that it has William Katt and George Wendt fighting demons. That in and of itself was enough for me to watch it. House isn’t a bad film, but don’t go in expecting too much. 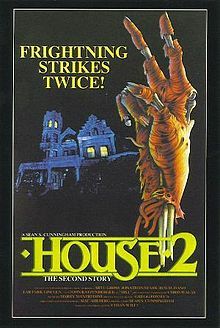 While House wasn’t that much of a success, there was still a sequel released one year later, and I have to say I love the title: House II: The Second Story. Get it? Like the second floor? Story? Moving on. Jesse (Arye Gross) and his girlfriend Kate (Lar Park Lincoln) are a well off couple who move into a mansion that has been part of Jesse’s family for generations. While they’re there, Jesse does some investigating into his past and finds that his great great grandfather found a crystal skull in an Aztec temple and it may or may not be buried with him in the graveyard on the hill next to the house. This prompts Jesse and his friend Charlie (Jonathan Stark) to head over and dig up the grave. What they don’t know is that the corpse isn’t a corpse, but is very much alive and insists on Jess and Charlie calling him Gramps (Royal Dano) after being dug up, crystal skull in hand. Now, Jesse, Charlie, and Gramps have to keep their secret from Kate and her nosy boss, John (Bill Maher), while also defending the skull and the house from extra dimensional beings and time travelers who want the skull for themselves, especially Gramps’ old foe, Slim Reeser. Remember how I used the word “cute” to describe the original film? Well House II is even more so, and I may have to go so far as saying it isn’t even a horror movie. This film is heavy on the comedy and fantasy but very light on the scares. This works both for and against the movie. Let’s start with the negatives so I can focus a bit on the fun stuff later. House II is a follow up to a horror comedy, so I went in expecting a horror comedy. Since I didn’t get that I feel like the movie comes off as both a little unnecessary and kind of disappointing. For most of the movie the comedy also comes off as excruciatingly obvious and not delivered all that well. Arye Gross isn’t much of a heroic presence and his line delivery often times comes out very awkward. The same can be said for Jonathan Stark, which is a problem since he’s supposed to be the main source of the comedy for most of the movie. If I’m going to be completely honest, this is kind of a hard movie to be overly critical with because it is such a light hearted film. In fact, in terms of it’s tone, it was more in line than the first House. Royal Dano as Gramps is hilarious and Bill Maher works great as the slimy boss with eyes for Kate. John Ratzenberger also has a small part towards the end and he is easily the best part of the movie. If I can be honest again, I have to say that this movie was very entertaining. There was some cool make up effects for Gramps and Slim Reeser and there’s also some fun puppet work when dinosaurs get involved. Yeah, I said it. Dinosaurs. This is a movie that knows exactly what it is and has fun with it, and it never gets bogged down with drama. Drama’s absolutely great, but House II was determined to be a comedy so it stuck with that. I honestly can’t believe I’m saying this, and I may be in the minority here, but I enjoyed House II: The Second Story more than the first movie. Both have their positives and negatives, but my biggest complaint with the first one was that it didn’t go far enough. The second movie dives head first into weird and doesn’t stop to take a breath. It is a tame outing, but it’s fun and so light hearted it’s hard not to enjoy it just a little bit. If you’re going in expecting a horror comedy like the last film, you may be disappointed. This one is more of a fantasy adventure mixed with comedy. If that’s still your cup of tea, I recommend this one with a smile on my face. Well there’s the first two House movies for you. Both aren’t masterpieces, but they certainly aren’t bad. They’re both light comedies that blend horror, fantasy, and some adventure. They aren’t movies you have to watch right this second, but they’re completely serviceable entertainment. 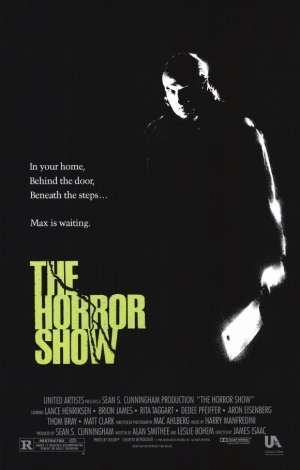 Check back soon for the second part of this review where I’ll be talking about House III: The Horror Show and House IV. When I was first getting heavily into film, one of my main inspirations was Darren Aronofsky. He went places with his movies that I never thought were possible. Requiem for a Dream has had an impact on me that not a lot of films have and that impact kept going when I saw his films Pi, The Fountain, The Wrestler, and Black Swan. I thought this guy could do no wrong. Then came Noah and I saw that maybe he isn’t perfect. Noah was a huge disappointment for me and I always thought it was a strange project for Aronofsky to take. 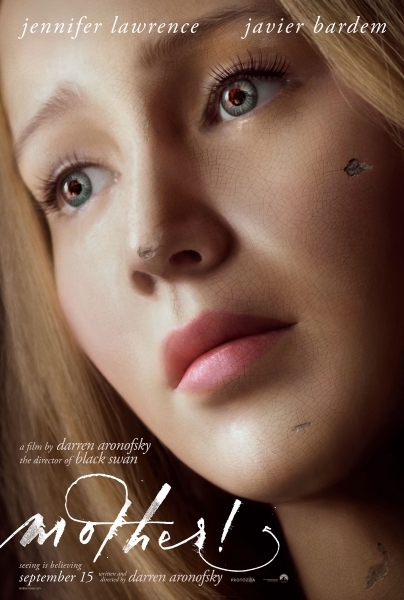 When I saw his next film, mother!, was going to be a strange psychological horror trip down the rabbit how, I felt like it was a return to form and I was super excited. Well, I’ve seen the movie and I still can’t get a grip on what I saw. This is going to be a rough review to write because I still have no idea how I really feel. One moment I hate it, and the next I find something to truly respect. Call for help. A woman known only as Mother (Jennifer Lawrence) lives in a secluded, dilapidated house with her husband who is only credited as Him (Javier Bardem). Him is a poet who is struggling with severe writer’s block while Mother works day in and day out trying to fix the house, which is actually Him’s old house which was destroyed in a fire. One day Man (Ed Harris) shows up at Him and Mother’s door, and Him allows Man to stay the night. The actions of Man upsets Mother and things only get worse when Man’s wife, Woman (Michelle Pfeiffer), shows up and Him also allows Woman to stay. As Mother is quietly tormented by both Man and Woman, more and more people begin inviting themselves into Mother’s house and invading her life to the point where her very existence is threatened by the endless mob of people. It is at this point that both Darren Aronofsky and mother! goes off the rails. Without spoiling anything, more people show up to the house and the great idea Aronofsky had is spoiled by doing way too much with it. Not only that, but he shamelessly bashes the viewer over the head with his religious symbolism that completely destroyed what my theory of the movie was about. It’s a relentless mish mash of violence and allegories and pretension. I get it Darren. We all get it. Settle down. It’s also at this time where both Man and Woman are nowhere in sight, and they were only one of the most interesting part of the movie. The tracking camera work that worked so well in the first half just becomes nauseating as things start getting crazier and crazier. I wasn’t really affected by what I was looking at. I wasn’t feeling angry anymore or upset for Mother. I wasn’t even laughing at the insanity. I was just getting so confused and annoyed at how far things were going that I was getting bored. It was a very strange feeling. So let’s weigh the good with the bad. The good is the first half of the movie that is filled with excellent performances, an idea I found very unique, and camera work that was very sure of itself. Like I said, I was sucked in for a while. The bad is pretty much everything else. The actual point of the entire movie is pretentious and completely destroyed what I thought about the film. The themes themselves are pretentious, but the obvious way Aronofsky uses them is just annoying. The idea that was great in the first half also goes way too far and is also ruined in the second half. It seems like it may be balanced, but when I say I hated the second half I mean that I HATED it. I really can’t talk too much about what I didn’t like in the second half because it would spoil the film. mother! is an anomaly of a movie. There are times where I admire it and there are times that it just bothers me. At this very point in time, I can still say I’m torn, but the film did anger me more than I wanted it to. I like when a movie can be angering for the emotional response that it needs. Detroit was angering, but that was the response that Bigelow wanted. mother! was angering just because of how annoying and pretentious the film got and how Aronofsky went way too far with his idea. I don’t know how I’m going to feel about this movie down the line or after repeat viewings, but this is how I feel right now. When I think of some of the best film makers working today, one of my go to names will always be Guillermo del Toro. At his most personal, his stories delve into the darkest of fantasies and bring them to life using real world consequences. We see this with films like Pan’s Labyrinth and Crimson Peak. On the flip side, del Toro can create spectacles for the big screen with a vision completely different from any other big budget film maker. Think of the two Hellboy films and Pacific Rim. 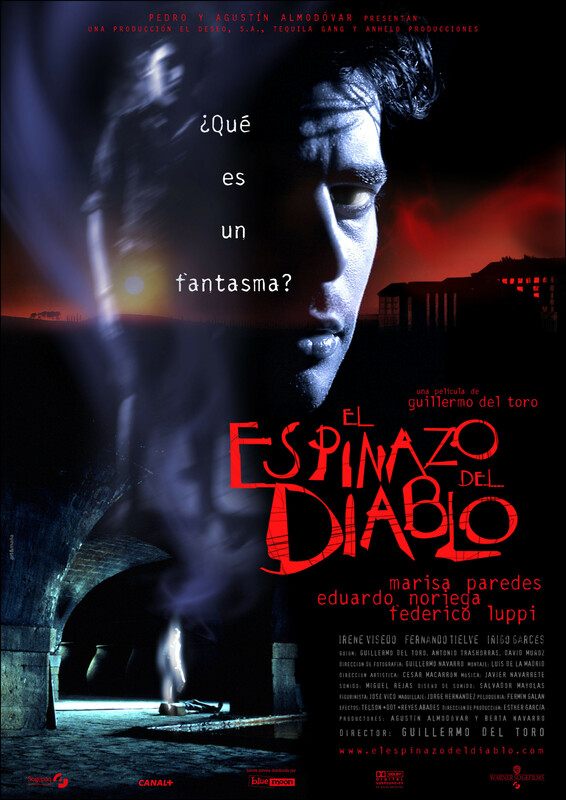 With it being the beginning of that wonderful season of Halloween, I thought it would be a great time to check out one of del Toro’s most praised ghost stories, The Devil’s Backbone, from 2001. He’s stated that this film is a sort of cousin to Pan’s Labyrinth and it’s clear why. This is a sombre tale of war destroying people’s lives, while also offering a spooky ghost story and a message of strength that bursts through the sadness to offer hope. To put it simply, The Devil’s Backbone should be considered a modern classic. Carlos (Fernando Tielve), an orphan who’s father was recently killed in the Spanish Civil War, is taken into an orphanage the wise Dr. Casares (Federico Luppi) and his fellow administrator and teacher for the kids, Carmen (Marisa Paredes). Upon arrive there, Carlos finds something very odd about the place, and it’s a something that’s quite obvious. There’s a bomb in the middle of the courtyard that landed and got lodged in the ground, but never detonated. He also hears stories from the kids there about an orphan named Santi (Junio Valverde), who mysteriously went missing when the bomb landed. One night, Carlos is out looking for water and comes across what seems to be the ghost of Santi who warns Carlos that many people are about to die. This apparition keeps appearing to Carlos, and it doesn’t take long for the other kids to believe him. Meanwhile, the groundskeeper, Jacinto (Eduardo Noriega), with the help of his friends begin scheming to rob the safe that Casares and Carmen have hidden in one of the buildings. As tensions rise between all parties, Santi’s warning of violence and death becomes an inevitability. There’s so much to love with The Devil’s Backbone, it’s hard to find a place to start. Let’s go with the story. Guillermo del Toro is a master storyteller, and he works really well with telling these creepy tales through the innocent eyes of children. We see what Carlos sees and we know only what Carlos knows. There are only a few scenes where we are privileged enough to look behind the closed doors of the adults at this orphanage and see an establishment that is haunted by both the ghost of a young boy, but also crime, deception, and lust. While being a horror story and a drama and an allegory for war, The Devil’s Backbone has a strong mystery at its core. What’s the deal with the bomb in the middle of the courtyard? How did Santi really die? What does the warning of violence and death that Santi give mean? There’s so many questions asked during the slow burn of the plot that it had me riveted. I had to keep watching to find out more, and the payoff is quite literally explosive. 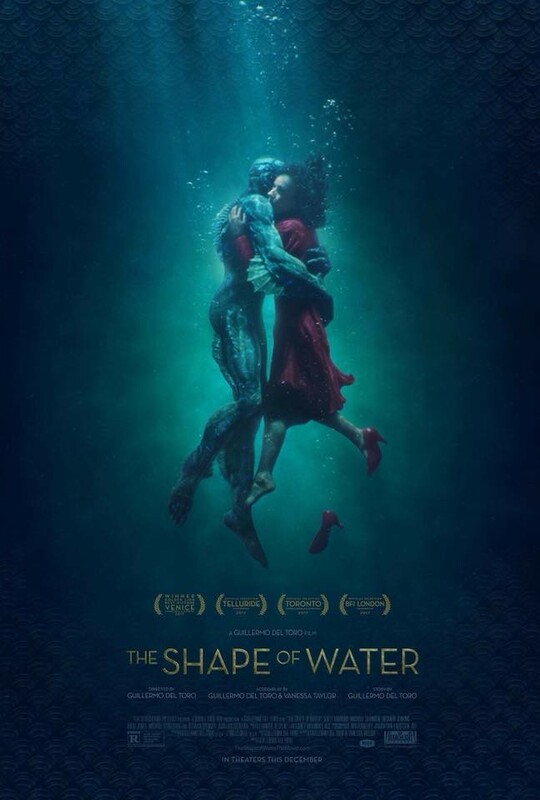 One of the most fun reasons to watch one of del Toro’s movies is his blending of genres and the fantastical with the brutal realities of life. The Devil’s Backbone is definitely a traditional ghost story at its core. A boy goes to an orphanage during a time of violence and is haunted by a ghost of one of its former residents. That may have been enough to support the movie, but it goes the extra mile. The humans in this movie often become creepier than the little ghost boy. The talks of the war and brutality that is happening in Spain is an ever present discussion by the adults in this movie that the kids can’t seem to comprehend. Jacinto also provides most of the actual horror in this film. He’s conniving and unpredictable and a true sociopath if I’ve ever seen one. Who’s stuck in the middle of all this? The children. They’re caught between the horrors of the real world and the people who inhabit it on one side and on the other the manifestation of the consequences of their actions. It’s not horror in the traditional sense, but it’s horror nonetheless. Amidst all this terror is a film that’s shot beautifully. 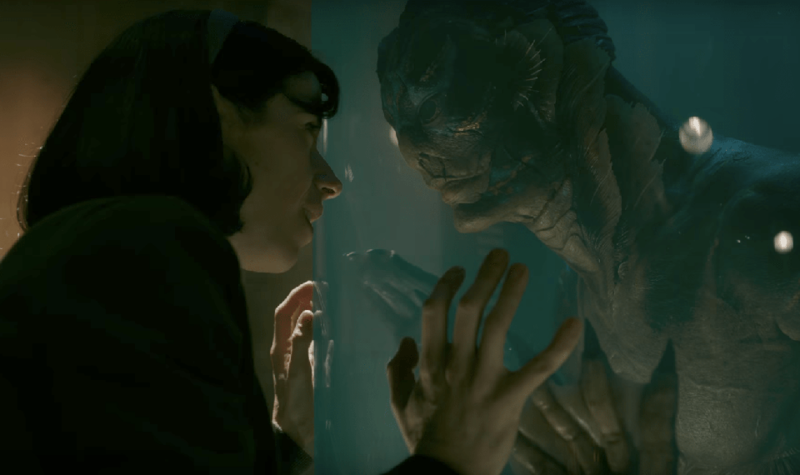 There’s something about Guillermo del Toro’s eye for things that isn’t extravagant, but it’s enough to hold your attention. It’s hard to explain, but he just has a way of showing just what needs to be shown in the exact way it needs to be. Can I get any more vague than that? Probably. Just give me the chance. The design of the ghost is also great, and it’s clear that he puts a lot of effort into creating his different specters and creatures for his movies because they always seem to stand out in some way. Santi is one of his greatest creations. He’s just a pale ghost that can be seen through, but what really makes it special is the trail of blood that comes out of his head and slithers through the air. Try to get that image out of your head. I dare you. What else more can I say about The Devil’s Backbone? I absolutely loved this movie. It’s a haunting tale of ghosts, violence, and war but ultimately ends with a message of strength and bravery even for the most innocent of people. This is a film that masterfully blends gothic horror and the drama of the real world with the victims here being children. Sounds pretty heavy, right? It is and I respect del Toro for making a movie like this. He truly is a master and this is one of his greatest creations. The first three films in the Return of the Living Dead series work at varying degrees of success. The first film is a riot that boasted some excellent special effects, the second film overuses slapstick, but provides enough entertainment to have some fun. 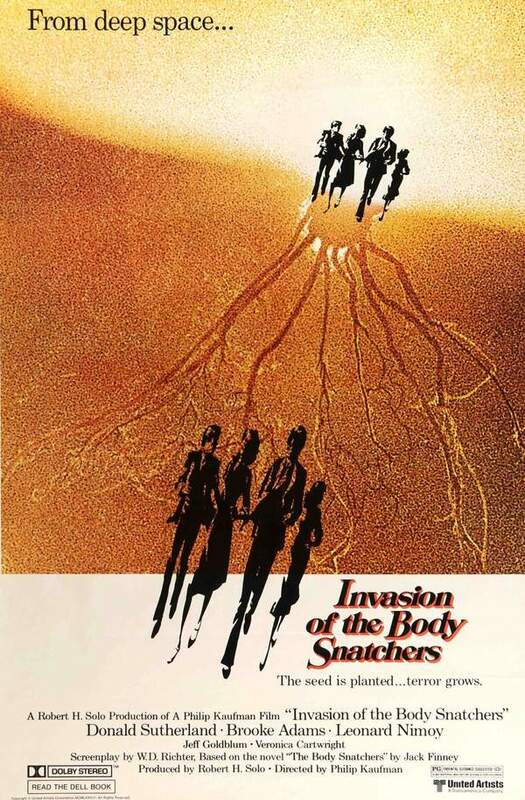 The third film was kind of a departure and worked with a more serious approach, which felt kind of funky at times, but I still loved the zombie action and special effects. Now we enter the world of direct-to-DVD where no one is safe and you really never know what you’re going to get. That being said, lower your expectations to the most basic settings and let’s see what these movie have to offer. 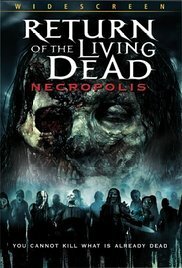 Both films were shot back to back and released in 2005, with the first being Return of the Living Dead: Necropolis. Julian (John Keefe) knows his Uncle Charles (Peter Coyote) is into some shady business at his job in the multibillion corporation known as Hybra Tech, but he isn’t quite sure how deep down the rabbit hole he is. One day, Julian’s friend, Zeke (Elvin Dandel), injures himself in a motocross accident and is taken to the hospital but declared dead before he even arrives. Julian and his group of friends soon find out that isn’t the case and he has in fact been taken to Hybra Tech for testing and experimentation. The gang decides the best idea is to break into the company’s headquarters and rescue Zeke. While there, they find evidence that Charles and Hybra Tech has been experimenting with the deadly Trioxin gas to create zombies to use as ultra powerful bio-weapons. One thing leads to another and the experimental zombies are on the loose in Hybra Tech which forces everyone stuck inside to fight for their lives or join the undead horde. I really don’t know where to begin here. This is one of the stupidest movies I’ve ever had the pleasure of watching, and I do say it was a pleasure because I laughed out loud at the unabashed idiocy this narrative had to offer multiple times. First of all, the fact that a group of teenagers think it’s a good idea to use their extreme sport skills to break into a highly secured building is something that I can’t suspend my disbelief towards. They come up with this idea so fast and unanimously without any hesitation. They’re also really skilled with all types of firearms, which is really convenient since they’ll need all the help they can get when the zombies finally break out. Oh, right. The zombies. Yeah, it takes forever for more than two zombies at a time to be shown on screen. This is a low budget movie that went straight to DVD then to the SyFy channel, but my god, this movie drags on and on with the stupidest characters I’ve seen in a while. There’s just so little logic used in this movie that it numbs the mind to such an excessive degree. One of these teenagers WORKS SECURITY AT HYBRA TECH. What did they think was going to happen with employees like a teenager and three other inexperienced hacks being the only line of defense for the Trioxin gas and a horde of zombies? Were the writers thinking about anything at all? When the zombies do start showing up and the action gets going, there are a few moments of fun, but how many fist fights with zombies are there gonna be? Why can the be so easily killed while the zombies in the first three films proved to be so difficult? I just have so many questions for the writers that I seriously don’t know where to begin. I could go on and on about Return of the Living Dead: Necropolis, but I just start running myself in circles with unanswered questions about direction, acting, editing, and how this could’ve been green lit in the first place. This is one of the most hilariously sloppy films I’ve ever seen and it completely besmirches the anarchic attitude of the first three films. This is so mind numbing and senseless that I can’t recommend it to anyone. It’s good for a laugh considering how terrible it is, but do you really want to waste an hour and a half of your life that bad? Here we are at the last film of the series. I just want to take a moment to look back to 1985 when the first movie was released, and the impact it had on audiences looking for something to have fun with. We’ve gone from cult classic to this, and this here is the bottom of the barrel. 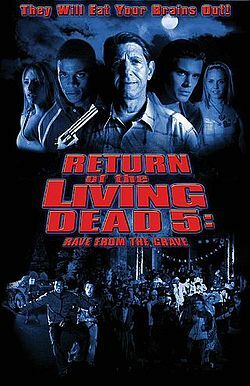 You can just tell by the title: Return of the Living Dead: Rave to the Grave. A year after the events of Necropolis, Charles has the remaining Trioxin and plans to sell it to Russian Interpol agents whose job it is to destroy. Unfortunately, the Trioxin is released once again and the threat of a zombie apocalypse looms its undead head. Julian and Jenny (Jenny Mollen) find more Trioxin in Charles’ house and bring it to Cody (Cory Hardict) in the university science lab. It’s found that the Trioxin has similar elements as some hallucinogens, where Jenny’s raving DJ brother Jeremy (Cain Mihnea Manoliu) has the bright idea to try a bit of the Trioxin and sell it as a new street drug called “Z.” Much to Julian’s protests, the Trioxin is synthesized and sold to the students before the rave, and it doesn’t take long for the real effects of the gas to show. Now it’s up to Julian, his friends, a duo of bumbling Interpol agents to save the world from certain zombie doom. This movie is the purest of garbage. It’s such an insult to what this series once was and the craft of film making in general. Let’s talk about the most glaring problem Rave to the Grave has, and there are plenty of them. I’ve never seen a movie with such a huge problem maintaining continuity. Ok, that’s not quite true. The Pink Panther movies are all over the place, but at least those films are enjoyable. This one has the audacity to name the characters the same names but completely wipe their memories of what they saw in Necropolis. Why are they surprised and completely unprepared when it comes to zombies? Why is Cody being such a jerk and fooling with Trioxin gas like he has no idea what it is? Why is Julian still living with his Uncle Charles? Is there any attempt to maintain continuity at all? I was so confused at first, not knowing if this was a sequel or what. I still don’t know, but why should I even care? The creators of this film also try really hard to bring comedy more to the foreground with this movie and it’s an absolute failure. The comedic relief comes with the Interpol agents, but the extent of their humor comes from misunderstanding each other and shooting someone by accident while yelling “SORRY!” It’s the basest kind of comedy there is and a far cry away from the biting humor of the original film. We also just have characters that make the worst decisions of all time. Like, “We found this chemical in my uncle’s attic, so let’s synthesize it and sell it as a drug, or, “Let’s just fire our weapons in a crowd full of innocent people.” These have to be the dumbest people I’ve ever seen in a movie. I wish I could say their acting at least saved their characters a little bit, but I can’t. The acting is awful. That’s enough about that. Return of the Living Dead: Rave to the Grave is one of the worst movies I’ve ever seen, and I’ve seen some real stinkers in my time. There’s nothing funny about it, there’s nothing even remotely scary, and much like the last film it’s just plain boring. What started out as such a fun series has devolved into this, and there’s really no redeeming it at this point. This film deserves the lowest grade I can possibly give, and that’s exactly what it’s gonna get. These last two films are a huge disappointment in an otherwise solid series. 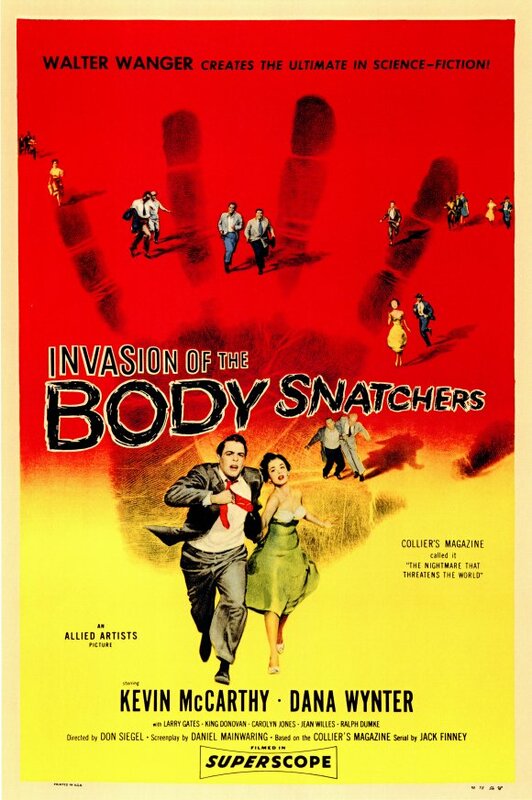 The first three films are certainly worth the time of any fan of the horror genre. These last two, however, shouldn’t even deserve to exist. There’s barely anything worthwhile in Necropolis and nothing in Rave to the Grave. Skip these two entirely.